One car has already got into a treacherous trap. 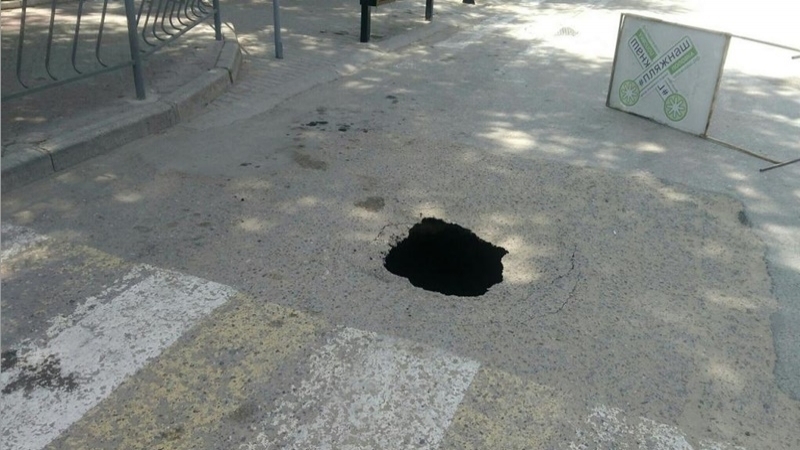 A real "black hole" appeared on the roadway of one of the streets in the city of Yevpatoria in the occupied Crimea, users of social networks say. One of the photos shows that the wheel of a Daewoo car got into the hole and caved in it which prevented any further movement of the vehicle. After the incident, barriers and a warning tape were placed at the dangerous site. The situation with roads in the Russian-occupied Crimea is constantly causing a sarcastic reaction of Crimeans and users of social networks. The subject of ridicule is often not even the emergency condition of roads, but the "repairs" carried out under the leadership of the occupation authorities.